Anna has finally found happiness and love in her romantic life with her shifter husband Frey. Unfortunately life often delivers the good with the bad and for Anna this means mourning the death of her mother. When Frey and her step son John-John return to the America, Anna decides to stay behind and help her father and niece adjust to their loss. Someone has been kidnapping young girls and even after the parents pay the ransom the girls are still murdered. This new story goes from something awful to something close to home when Trish's best friend is abducted one day. Deciding that poor Trish has suffered enough loss for someone so young, Anna decides that no matter she is going to find Cecily but to do that she has to enlist the aid of one the world oldest vampires - Vlad. With time quickly running out Anna learns that there's much more to this rash of kidnappings than what the human authorities think. Anyone new to the Anna Strong Chronicles will really not have a hard time following this story though it is 9.5 in the series. Stein does a good job of telling her story without requiring readers to have a lot of knowledge about her world; however, this means that for longtime readers, there's really not much on offer except the fact that Anna has settled into married life which we knew at the end of Blood Bond. That's not really a lot to offer readers after a three year hiatus, particularly when we were lead to believe that Blood Bond would be the last in the series. I understand that a short story is meant to be a vignette but this just felt shallow particularly given that Anna got her HEA at the end of the last book. It really is not helped that at least a good portion of the plot is recycled. Once again we were given the specter of vampires seeking to take over the earth and use humans as blood bags and servants. This issue was already settled so the only reason to go over this territory again is perhaps a shortage of ideas on the part of Stein. Fortunately, because this is a short story, it didn't last long enough for me to be completely bored but it reading it was about as exciting as watching we paint beige paint dry bland...bland...bland. Where Stein did go right was the discussion of France's xenophobia and it's treatment of migrant workers. Given recent world events like the murders at Charlie Hebdo, the Paris attacks, and the UN calling out France for its failure "to curtail the soaring trend of violence, hate and xenophobic speech against foreign communities", the plot line of Anna and the Vampire is at least on point when it comes to current events. The problem is that something this series cannot even remotely begin to be discussed in one book, let alone a short story. It's reductive at best and fails to give the subject matter the seriousness that it deserves. I don't object that Stein went there, I object to the fact it felt like she barely committed to the point she was trying to make, particularly when the last part of the book is filled with Vlad's abdication of power and his declaration of love for Anna. It felt odd to have a story in which immigrants were going to be blamed for the abduction and murder of young girls and even concern that said immigrants might be attacked without once hearing from the people in question themselves. It made me wonder if Stein realises that the subaltern can and does speak? What is the point of mentioning poverty, unfairness in the criminal justice system and neo colonialism in the form of migrant workers without once ever giving voice to the oppressed? What we got instead was their experiences used as background fodder for Anna's attempt to save the ever so white and French Cecily. Even for a short story, Anna and the Vampire Prince felt extremely rushed. It quickly went from kidnapped girls, police corruption and worry about violence against immigrant communities to a vampire conspiracy to enslave humans. It felt like two stories shoved into a scant 75 pages. It makes me wonder if Stein just mashed together two ideas that she was working on and forced them to fit. It was like trying to squeeze a square peg into a round hole. 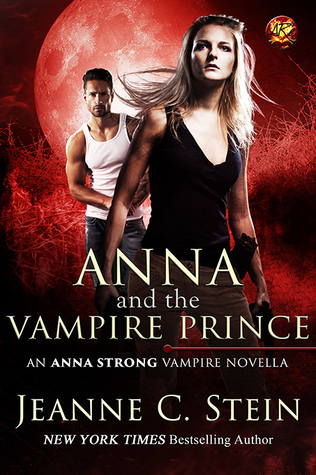 Anna and the Vampire Prince is completely erased and while it was disappointing because Strong invoked neo colonialism and xenophobia, it was a bit of relief given the treatment people of colour have received in this series. Anna and the Vampire Prince has no LGBT character or disabled characters either. It's about as white and straight as can possibly be with a brief mention of one character of colour from previous books. Anna and the Vampire Prince screams of all the things it could have been had Stein simply committed herself. Instead of showing talent, insightfulness and daring it was a gutless foray into a world which had already reached its zenith.